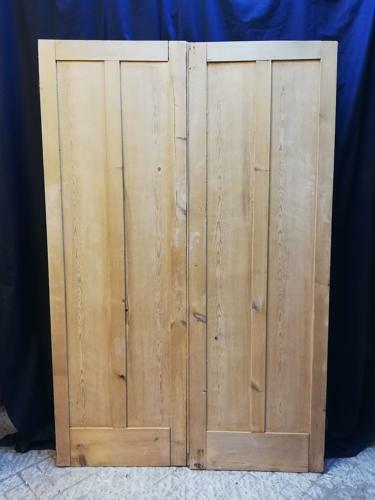 A pair of Victorian stripped pine cupboard doors with a rustic style appearance. The doors have a simple and functional design with plain panels and a thick base rail. The cupboard doors are solid, well made and have been stripped ready for finishing by purchaser, with perhaps a wax or paint finish to suit. The door hardware has been removed for purchaser to add their own but the hinges are present. The cupboard doors do have some slight signs of wear due to age. The doors have some small holes, thin surface cracks, splinters and knocks. The rebated edge has some damage to the base and middle and has had some patch repairs, please see pictures for details. There are some marks, scratches and stains where door hardware has been removed. There is some very slight shrinkage to the wood near the joints. The doors will need to be levelled slightly as one door is slightly higher than the other. The doors are ideal for a large kitchen or bedroom cupboard and their simple and classic design make them suitable for many types of property and many types of project.